Making Demcon particularly of interest to visitors was the number of product premieres. The company Twilldrill presented a unique innovation for concrete cutting where the core bit is collected to eliminate risk of it falling out and causing damage, which also eliminates the need for heavy, and potentially damaging lifting. Other products presented included new demolition robots, new machines for grinding and polishing of concrete floors, robots and tools for effective hydrodemolition and handling of slurry and dust (where the manufacturer Sila showed its new line of vacuums) and much more. 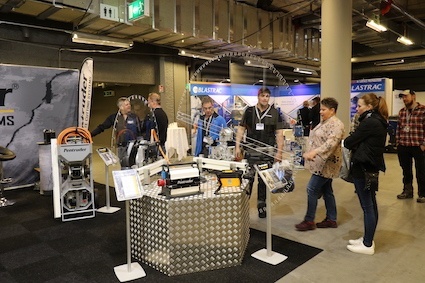 Sweden’s two manufacturers of quick-couplings’ for hydraulic attachment exchanges, OilQuick and Steelwrist, also exhibited their latest developments. 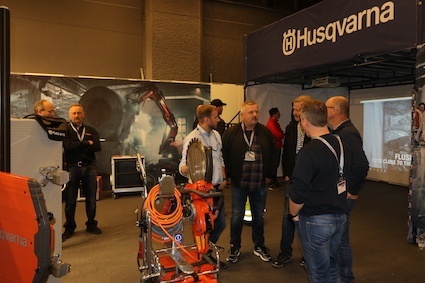 Some of the distributors of hydraulic demolition attachments, such as TreviBenne (through Andersen Contractor) and Epiroc (Maskinia), also exhibited at their own booths. One particular aspect of this year’s show was that many suppliers of hazardous material and waste handling equipment exhibited; with all reporting to be ‘highly satisfied’ with the exhibition. These new exhibitors were particularly pleased with the high numbers of visitors on both days of the show, which in the past has tended to see high visitor numbers on the first day, but tailing off on the second. This year also saw more exhibitors with large booths, including Drome, which was located by the entrance, welcoming visitors as they entered the hall. Other exhibitors with expanded booths were Hilti, Jack Midhage AB and Jerneviken, whilst joining the ‘big-booth club’ of regulars were Tyrolit, Husqvarna, Pullman Ermator, SDC, Pentruder and Dustcontrol. As with previous shows, there was an outdoor section at the exhibition this year, which enabled the demonstration of equipment and tools. 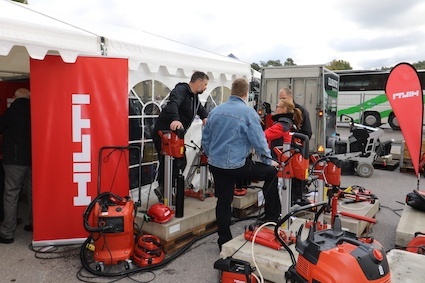 Hilti once again exhibited here (and enjoyed many visitors), whilst Finnish manufacturer Levanto demonstrated Japanese company Shibuya’s core drilling systems, which they market and distribute throughout the Nordic countries. Jerneviken, Tyrolit, Husqvarna, HTC and Atlas Copco also took full advantage of the outdoor section. The main sponsor for Demcon 2018 was SDC AB (Swedish Diamondtool Consulting) which is headquartered in Nora, and has a subsidiary located in Stockholm. SDC is well known in the business, with its reputation easily judged from the high numbers of visitors to its booth. The next sponsorship level included Ruby sponsor Pentruder AB and Platinum sponsor Husqvarna Construction Products. The Gold sponsor for the exhibition was Tyrolit; Bronze sponsors were Jack Midhage AB and Drome AB. Demcon has always enjoyed the support of leading trade associations. These included Riv & Saneringsentreprenörerna (Swedish Demolition Contractors Association), Håltagningsentreprenörerna (Swedish Concrete Cutting Association), and Branschorganisationen för byggnadsberedning, colloquially knowns as BFB (The Trade Organization for Construction Preparation). The exhibition was also supported by the European Demolition Association and IACDS (International Association for Concrete Drillers & Sawers) who had representatives present at the exhibition. The two associations also arranged workshops for Nordic contractors during the two day show. BFB held their autumn meeting on the Thursday on the first floor of the Scandic’s conference hall with around 70 members attending. As well as its industry leading exhibitors, a stand out feature of the exhibition is the Demcon party, which also sees the presentation of the annual Swedish Demolition Awards. This year’s event took place on the evening of 27 September at the Scandic Infra City Ballroom, where contractors and exhibitors enjoyed a gala dinner, with the winners of the demolition awards being announced. Following a series of speeches and award presentations, the funk band ‘High Frequency’, entertained the participants. 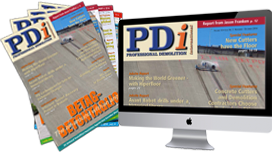 This year’s gala dinner was sponsored by SDC AB, Pentruder and Husqvarna. The Swedish Demolition Awards jury consisted of Bo Hörnqvist, founder and previous owner of Rivab; Gunnar Landborg, founder of Disab and a key figure in the Swedish concrete cutting industry; Jan Lemos, founder and previous owner of JL Betonghåltagning; Lars Eriksson, founder and previous owner of Södertälje Borrteknik; Tommy Hällgren, previously at Brokk; Arne Holgersson, previous product manager and sales manager of Tyrolit. Other judges included Lars Sandström, president of BFB, Roger Blomgren, secretary of BFB; Michael Appelgren, editor in chief of ME Tidningen, and Jan Hermansson, editor of PDi and organiser of Demcon. This year’s awards saw a new category being presented, ‘Rookie of the Year’, making a total of 17 awards being handed out at the gala dinner.